Hi all, I've bought a couple of Neostylopyga rhombifolia this weekend on a fair. I know that sometimes they die without an appartent reason, and otherwise they thrive. The person who sold them to me told me that he keeps them absolutely dry and without substrate, just egg crates. An appel from time to time should provide the water need. Can I follow these guidelines or does anybody else has an alernatve experience? Elliptorhina chopardi - Tips for care? The newborn nymphs are extremely flat. If you keep them without a slippery barrier you have to be aware that the tiniest crack is enough to escape. And they really like escaping. I use beech chunks. These are not shavings but morsets and don't have the dust issue. I buy it in a pet store, so it's completely safe. I use it just because I find it more appealling than bare ground. I also don't clean the cages every week, so it's convenient that dirt sinks into this substrate instead of piling up. If kept in a moist environment combined with few aeriation, it's really susceptible to fungi but in other conditions it's great stuff. 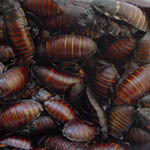 Are there any live plants I could use to decorate the terrariums of the roaches? Nearly 4 months at around 24°C. I never do anything special with the oothecae so they are handled just like the adults. They are pretty tough, I just pour water in the substrate when conditions become too dry. I also don't mind temperatures too much, the water is room temperature, so pretty cold in comparison to the warm substrate they lay in, but that doesn't seem to be a problem. If you keep conditions hygienic things should work out fine. I finall have some little ones. I do hope that more will come soon. Thank you for the answer! I'm not quite certain what a vestibulum is, but I can image. I think he means that they are easily converted to gas and transported by air. Sorry for the late answer. I give all kinds of oak. If they don't like it, they musn't eat it, but they always do. Most of the oak is 'european oak' , loosely translated from dutch, which is Quercus petraea and Quercus robur. Just some pictures of a couple of my tesselatas. I was told that the last picture shows the feromone glands. Is this correct and could somebody give us some more information about it? E.g. why are they protruding? They look like big fat hameroids. A couple of years ago I've done an experiment in which I put all the tiny hissers apart to create a new colony without mites. The two cages were several meters apart. It went ok for a couple of months but then I suddenly noticed the little mite buggers in the new colony as well. That's why I supposed the mites wouldn't mind to forage for new territories. Then I guess there must have been an 'accident' while catching a baby roach and some mites must have accidently travelled on my hand into the new colony. This one is very yellow. My first yellow ones are starting to appear but way not as spectacular as this (I think) lady. Nice one!! Very nice picture! Sometimes it's a pain in the @$$ that the best shooting angle is not always possible when action is going on. But of course you leave them so they can make many more baby roaches. The variation in wing coloration is pretty cool. Is it individually based or sexe based?